The reason I was concerned about my ability to enjoy these new episodes is that because I knew, deep down, I would never enjoy these episodes at the same level as I did the first 3 seasons. I just won’t. Those episodes hold a place in my heart and comedic memory that will not soon be replaced. The show reached a level where it didn’t matter if I saw a couple of dud episodes in mid-season 2 (and there are a few), I knew that the show was great. And I know that after all this time, Arrested Development season 4, no matter how well-written, intelligent, crisply directed or shrewdly acted it is, it will not sit next to Arrested Development Prime (the first 3 seasons) in my televisual memory. It’s doomed to be another Family Guy – although that show did get objectively worse. Then I actually watched the show. The familiar banjo music started playing, Ron Howard’s dulcet tones graced my ears and everything right with the world. Puppies and unicorns started dancing together, tulips bloomed a month early and even Kanye West smiled. Well, at least for the first few minutes. The premiere, if it can be called that, naturally sees Michael as the lead. However the episode has to do a lot of heavy lifting in order to take the series from where it left off in the season 3 finale Development Arrested, to its current narrative position. It also has to reintroduce the sizeable cast (most of it) to show where they now sit both in terms of their relationships to one another and their finances. The strain is evident and the show becomes more reliant on the hack device of the narrator (despite being the wittiest narrator on TV) than it has ever been. 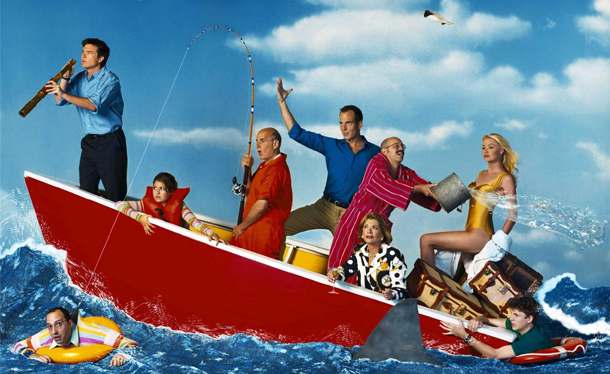 The episode also focuses a lot on the dealings of the Bluth Company and the financial health of the family; familiar plots which the show dipped into several times throughout the series and was ultimately never a great breeding ground for comedy. It’s all very plot heavy and after a while you stop caring about who owns how much and who’s in charge. I’ve never really known who’s in charge, it honestly doesn’t seem to matter, Michael will always be the only one who actually works in the family. The main plot that takes place (essentially) in the present of the episode simply involves Michael living in George-Michael’s dorm at UC Irvine and the obvious issues George-Michael has with this situation (and for some reason Maeby is also around). This is a highly simplistic plotline and it did a great job highlighting Michael’s often selfish behavior and his perpetual flaw of never listening to his son. It also showcased some of Jason Bateman’s best acting, especially in the scene where Michael thinks he’s being kicked out by his son (he actually is, but as usually George-Michael rescinds his suggestion to spare his father’s pride). That scene is both hilarious and exceptionally awkward, even by AD standards, in Michael’s slowly collapsing façade of good-humoured passive-aggressiveness. However, this storyline overall still managed to drag, despite the thin premise, perhaps due to the show’s inability to cut between several plots at once, which gave the show its manic energy. The premiere seemed to use a lot of footage from the old seasons, but it didn’t feel like padding, mostly because the show always reuse footage to realign the audience after its complicated web of stories, so their use here is justified even more so, though I do hope that they are kept to a minimum as the season roles on. Callbacks, which are also a heavy feature of the series, were also gladly not overdone. It’s natural after such a long absence for any callbacks to seem pandering, but most of them, the forget-me-now, the sad snoopy walk, are relevant to the story and still elicit chuckles, and not in an ‘I see what they’ve done there’ way. The need to tie all the characters stories together without most of the family interacting is certainly going to lead to a season that is over-plotted and less dense with laughter, but as long as it still manages a few zingers an episode (and it does), I’ll keep watching. Now from what I understand each of these 15 new episodes will mainly focus on a single character and will run various lengths (the first funs almost 32 minutes). I worry that, as this episode demonstrated, not having 100 balls in the air, and 9 characters with interconnected plotlines running around, could kill the energy of the show and highlight the flaws in the storytelling. But seeing as this episode had to provide a lot more backstory then the next episodes will (hopefully), it’s understandable that the comic rhythm the show is famous for, was waning a little in the premiere. All episodes have been made available at once, but I’m watching one at a time. Having said that, I feel like I won’t truly be able to judge this season until I’ve finished all 15 episodes (now that I’ve written that, it seems like a stupidly obvious statement), but let’s judge anyway. – Kristen Wiig would actually make a good young Lucille. – God help me, racist jokes still sound hilarious coming from this family. The idea that Lucille would invent a holiday to replace Cinco de Mayo, just because her housekeeper wouldn’t work on the holiday is evil and hilarious. – By that same tack, the whole gag of tipping African Americans was one of the funniest of the episode. – The dead mailman. Just the idea that Sudden Valley is so poorly planned that the mailman died trying to get there. – Michael’s expulsion from the dorm scene was genuinely moving in parts and like I said Bateman was fantastic in this episode. – Surprisingly I still find Lucille 2 falling over to be funny. This is solely due to Minnelli’s commitment to the part. Notably the scene where Michael tries to kiss Lucille 2 is classic Arrested Development. – The music seemed off and overdone in this episode. It’s not usually this distracting and it became needlessly serious in parts. – Unnecessary cameos. They weren’t overly distracting, and like I said I enjoyed Wiig, but Rogen is NOT George Senior and I’m not sure what the Workaholics crew is doing on this show. – Also why was Sally Sitwell (admittedly one of my least favourite characters) in this episode? – GOB’s run-in with Michael didn’t work for me, even though Will Arnett is usually able to make every stupid thing he says seem hilarious in its unearned arrogance. – The vulture was funny, but the tumbleweed was just too much, despite Michael’s attempts to kick it providing some laughs. Long story short: I enjoyed it. Who cares if it’s not at the level of season 1-3. Very few things are. I’ll take what I can get. This entry was posted in TV and tagged 4x01, Arrested Development, Flight of the Phoenix, Jason Bateman, Michael, Premiere, Season 4 by Nicholas Hayes. Bookmark the permalink.